Far from the streets of Corinth, the Fort Point Light stands sentinel over the relentless crash of waves on the shore and man’s comings and goings on the ocean. The lighthouse keeper, Cutler, is as gray and craggy as his ward, but after 15 years of solitude, 6 strangers appear one day heralding a changing wind. 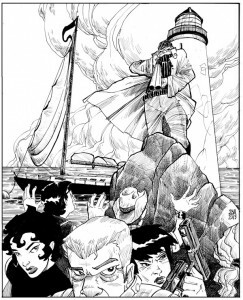 A foul air blows from the south, and only with the help of the lighthouse keeper can our heroes go further. With special guest star, Maine humorist Tim Sample.